BIG’s pyramid-shaped residential building on West 57th Street received final approval from NYC's city council on Wednesday. The project was finally given the green light after settling a dispute over the number of affordable housing units that should be incorporated into the development. Part of the negotiations between the city officials and the developer, The Durst Organization, also revolved around the inclusion of community facilities and a partial redesign of the building’s façade on West 58th Street. 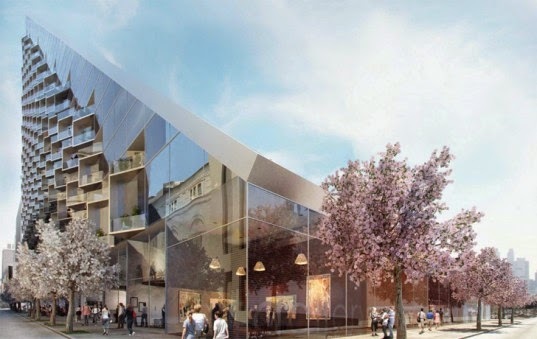 Read more: NYC Approves BIG Architects' Giant Pyramid Building for W 57th Street | Inhabitat New York City BIG’s unusual sloped structure aims to combine two types of architecture – European low-rise apartment blocks and typical Manhattan towers. The 38-story building, currently known as W57, will link the rest of the street to the Hudson River, creating mini-neighborhoods comprising 750 apartment units. The development is part of the city’s 80/20 program, which means 20 percent of the apartments will be reserved for low and moderate income families, while the remaining ones will be market rate. The community board, along with City Planning Commissioner Amanda Burden, had insisted on partially redesigning the West 58th Street façade, which was originally a block-long blank wall at street level. Previous modifications made during the reviewing process also included improving the connection to Hudson River Park at 59th Street, providing seating and landscaping throughout the site, widening the sidewalks and narrowing the driveways. Durst Fetner also promised to consult with the community board on including community facilities such as adult education centers and childcare facilities.